FileMaker Pro ( ) has long been the go-to Mac database, but for casual users its interface can be intimidating and its feature set overkill for things like tracking your DVD or CD collection, managing a list of contacts, tracking inventory of a small business, or even recording the progress of personal and professional projects. A program like Delicious Monster’s Delicious Library ( ) takes aim at specific types of record keeping, but it’s limited to library-like catalog functions. Others turn to spreadsheet programs like Microsoft Excel ( ) and Apple’s Numbers ( ), but those programs limit the way you manage your data. Bento, FileMaker’s new consumer-level database, aims to do for the database what Numbers and Pages ( ) did for the spreadsheet and the page layout program, respectively: make them easy and accessible for the rest of us. Bento fits right between FileMaker and library databases like Delicious Library by providing an approachable interface that appeals to the general consumer and a feature set that’s suitable for a single user to manage data. Bento easily handles data that's too cumbersome for a spreadsheet, yet doesn’t require the complexities of a professional-level database. The simple-and-friendly motif runs throughout Bento. In the main interface, the left pane is a source list of your data libraries, the middle pane shows individual records, and the right pane lists the associated fields of the library you’re using. 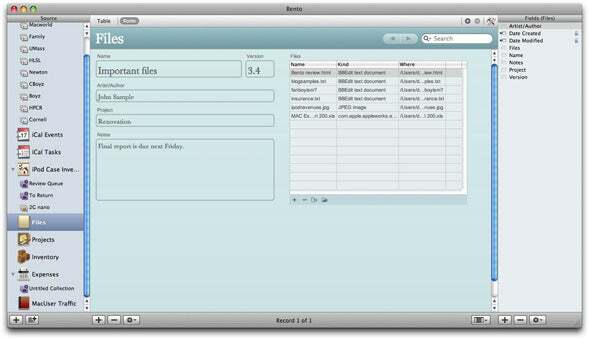 Bento looks and feels like an iWork application. Your records appear in the center, while your data libraries and sources are in the left pane, and available fields in the right pane. Each library tracks different data sets. Bento has more than 20 templates for commonly-used data like projects, inventory, and customer data. The templates can be edited to fit your specifications. You can make collections of particular records within each library, analogous to an iTunes playlist. Smart Collections allow you to select records based on your specific criteria, using a Spotlight-like interface (think Smart Playlists and Smart Albums). Bento supports only Comma Separated Value (CSV) for import and export. While CSV is a commonly supported format by most spreadsheets and databases, converting data out of its native format has its own problems. When you import a CSV file, Bento walks you through how many and what types of fields you want based on the file’s data. The effectiveness of that process depends largely on how clean your data is. In one attempt to import a spreadsheet of data, Bento wanted to create a bunch of extraneous blank fields. While the import wizard does let you tell Bento to ignore certain fields, you have to do it one at a time. Bento can also automatically tap into two common sources of data already on your Mac: OS X’s Address Book and iCal. By default, Bento creates libraries for contacts, events, and tasks. You can easily remove these libraries, but you won’t be able to reference that information in any your databases if you do. Address Book and iCal libraries access those databases directly. If you alter any of the information in Bento, it’ll change in the respective program and vice versa. And while removing those libraries will not harm your data, if you delete individual records, that data will be removed from Address Book or iCal. One of Bento’s strengths is the sheer variety of data types it handles. You can create basic fields for text, numbers, drop-down menus, or checkboxes. You can also store pictures, sounds, movies, ratings, addresses, phone numbers, e-mail addresses, and more. 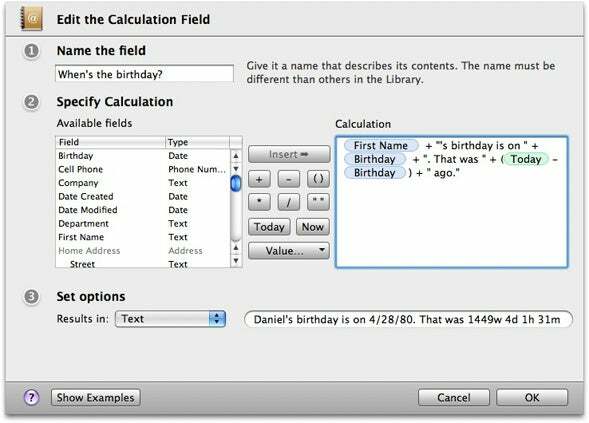 Bento even has a calculation field for combining text and values for multiple fields or for simple mathematical operations. No need to work out complex calculations on paper before you enter them. Bento makes it easy to define a calculation by identifying the content within a particular field. Click the fields, click the mathematical functions, and you’re set. The field-specific behavior is typically Mac like. Clicking the calendar icon next to a date or time field will pop up a translucent calendar or clock panel; when importing a photo, you can choose to take a picture with an iSight camera, or use Leopard’s Open dialog box to easily access your iPhoto library. The heavy Bento lifting is done in the center pane. You can view a spreadsheet-like table of library data, as well as form views of individual records. Each is editable by clicking the customize icon in the top right corner. Bento’s customization is another example of user friendliness. Adding or removing a field from a particular view is as simple as dragging and dropping the field between the center and right hand panes. On the form itself, you can rearrange and resize fields with the mouse just as you’d expect. Other characteristics, such as text size, label positioning, and alignment can be edited via a toolbar, but there’s little control over font size and you’re limited to whatever font is used by the theme. Unlike a spreadsheet, a database lets you easily create relationships between different types of data. You can create a field called a Related Records List, and you tell the List which library you want to pull data from. Add that field to your form and you’ll get an empty table. Associating records is easy: click the “Add related records from a list” icon at the bottom of the table and Bento displays a list of records from the associated library. Editing data in a Related Records List changes the data in the related library. You can also add or remove related records; adding a record also adds it to the associated library, but deleting a record removes it only from the Related Records List. It’s inconsistent behavior but it errs on the side of caution. Bento is extremely limiting to anyone used to the complexities and power of relational databases. You can’t create Smart Collections based on data in the Related Records Field, nor can you create automatic relationships between records. Bento lacks AppleScript or Automator support, so there’s no way of performing automated tasks on your Bento data without exporting it into a separate app and reimporting. That’s a pain if you ever want to make similar changes to multiple records. Bento is a single-user database. Sharing a database requires you to either export the data in a CSV or copy over your entire Bento database, which includes all of your libraries. There’s no sort of networking component, so even if you use Bento to keep track of your small business’s inventory, there’s no easy way to tie that information into, say, your website. Bento is a pretty good solution if you’re looking for a simple way to keep tabs on data for yourself and yourself alone. At $49, it’s far cheaper than professional-level programs like FileMaker Pro, and it’s much easier and more user friendly. Bento won’t meet the needs of power users, but that’s largely by design. For tracking household expenses, insurance inventories, and even small businesses, Bento is quick, easy, and effective.